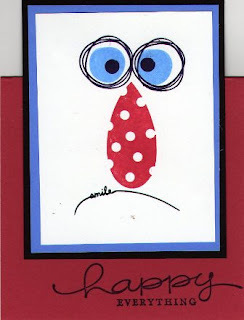 I found this card on Dawn’s blog with a tutorial of how to create this card. She has a great blog and I find her so creative, warm, and someone I admire! Thank you Dawn for sharing your creative ideas! Kivonne, this is HILARIOUS!! I love that face a lot! Your blog banner is amazing, too. I wanted to tell you that the last time I was here. Love your holiday banners! Cute! I get the "P" word going in me too! Way too cute. I love the face. What a clever way to use that stamp set.